Horizon is a spectacular office development based in an unrivalled location with first class amenities, transport facilities and offers large open plan floorplates, providing an efficient working environment at a density of 1:8 sq m.
With our reputation in the commercial property market and with our ever growing collection of bespoke brochures, we were exclusively appointed by leading property agency CBRE to design, develop and produce a full marketing campaign for their Trafford Centre scheme, Horizon. 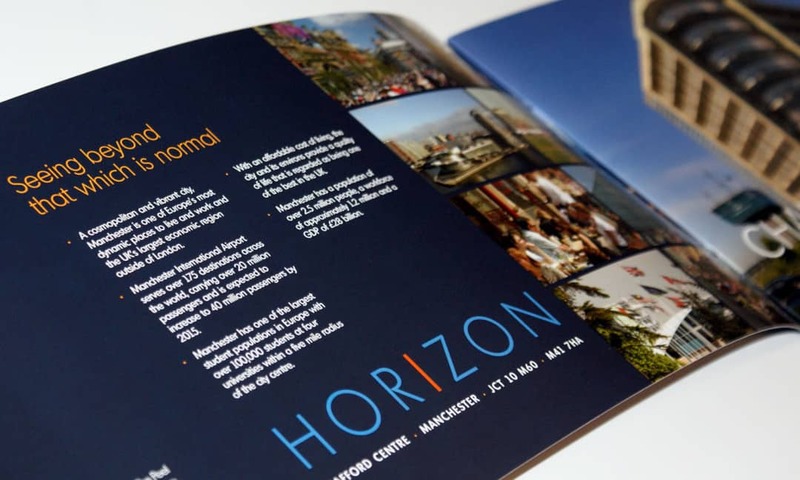 The marketing literature our team produced, which was unveiled to the North West commercial property market in 2011 included a bespoke twelve page brochure with a variety of custom drawn maps and floor plans throughout, demonstrating the scheme’s key features and selling points. The printed material also featured a spot uv finish throughout giving the brochure an eye catching look and feel. Striking external and internal and local amenity photography was also taken, along with the design and installation of new letting signage.